Johannesburg – The Independent Communications Authority of South Africa (ICASA) is inviting all interested and affected stakeholders to the workshops on South African Local Content for television and radio following the publication of the draft regulations on these broadcasting services. The draft regulations on South African Music once finalised will apply to sound broadcasting services i.e. all public, commercial and Community radio services, whereas, the South African TV Local content Regulations deal mainly with programming on television such as drama, documentaries, soap operas etc. The aim of the workshops is to solicit input on the two Draft Regulations subsequent to which the Authority will conduct public hearings and publish final regulations based on the inputs from the workshops, written submissions and public hearings. The publication of the draft regulations comes as a result of ICASA having been in consultation with industry players, where extensive consultation was undertaken by conducting a Cost Benefit Analysis on local content. Industry Players were interviewed together with independent producers and industry bodies and a Discussion Document was published for comments followed by provincial workshops on the Discussion Document. Subsequent to that, the Authority analysed the submissions to the Discussion Document and Published the Findings Document. The Authority has now commenced with the consultation to develop regulations that will govern and address compliance in relation to the broadcasting of local content on radio and television respectively. 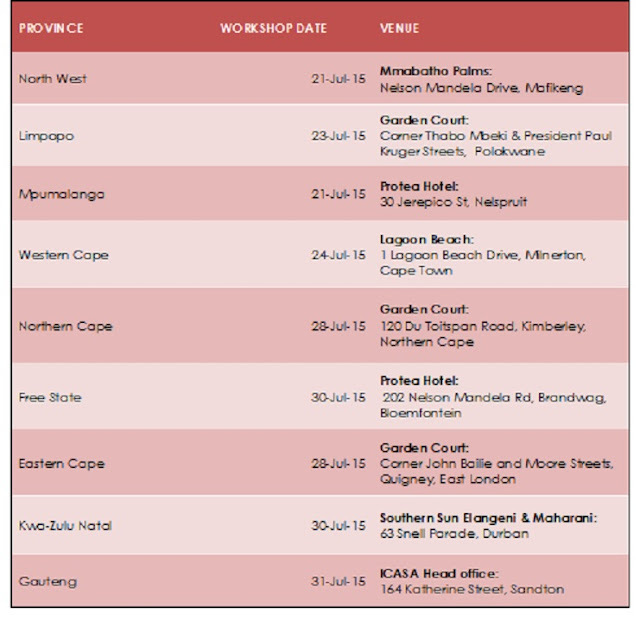 All interested stakeholders wishing to attend the workshops or require further details thereof can contact Ms Mamedupe Kgatshe on (011) 566-3259 or mkgatshe@icasa.org.za.